Sip in style from our Monogram Glasses. We will embellish any wine glass with the crystal color of chose. 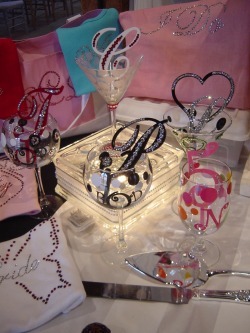 Monogram Glasses make great gifts for House Warming, Birthdays, Bridesmaids, Holidays and so much more. This item can be personalized with a single or three initial(s). This glass comes with Green, Hot Pink, Lt. Blue, Lt. Pink, Orange, Red, White, Yellow Matt Gold dots and is monogrammed with a Curlz Font Lettering. You chose your colors. Sold individually or in sets of 4 and 6. Great for your wedding cake table then on your dining room table after the wedding, candle stand, head table or a wonderful gift for the happy couple that no one else will give them! This is even a perfect gift for yourself!